Post game logs here! 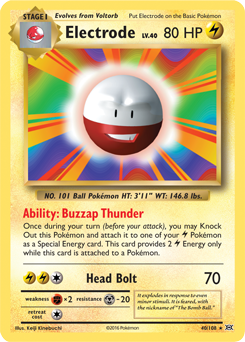 Electrode (EVO#40) "Buzzap Thunder" Ability occasionally soft locks the game. It has been discovered that occasionally the game will soft lock if Electrode (EVO#40) uses its Ability "Buzzap Thunder". This usually happens after selecting the Pokémon you wish to attach Electrode to. We understand this issue is frustrating and would like to reach out to the community to help track down the cause. If you experience this issue and have a game log to provide, please feel free to post your game log in this thread or you can submit your game log to the support team by clicking the support portal link in my signature. This issue seems to be a bit random on when it decides to soft lock the game so hopefully if we can get a few more game logs rounded up we can solve this! This soft lock issue been here for awhile was hoping to be fixed long time ago. But there are random soft lock issues at random point of the game...which cause 1 side or both sides to soft lock, in attempt to place a card down. This major issue must be fixed, because many times people are winning ended up getting soft lock. Impossible record logs as it happen too random. I've been using this card in all my lightning KO and damage challenges without any problems for months. I'm even using it more, trying to get this to happen. Though I have to agree that posting a log might be "a bit difficult" if the game crashes. Thank you for your input on this! This issue has been happening for a while now and it does seem fairly random on what all might make it happen. This thread was not intended to sound as though this was just discovered but more to round up information about a trending topic. We have been keeping our eye on the forums and noticed a few Buzzap instances that have popped up recently. The overall goal was to see if anyone else was experiencing this issue but I do understand that asking for game logs was a bit of a stretch considering the game freezes. We do value your input and any help you can provide about this or any other issues you have in game is greatly appreciated. Have you considered letting the client save the game log after every move? If it crashes we could get some ptcgo-current-game.log file in a known place. This could help with those oops-forgot-to-save-log moments too. Personally, I've managed to get the game log because that was not something like the screen which actually freezed, but the game progress, it wasn't possible to make an action, play a card, or even forfeit. The game was like stuck in an in-between turn but none of both me or the opponent were asked to do something, and our timers were freezed. I don't know if this will help, but in this game, my opponent behaved as though he experienced this bug, with all actions he took after I used Buzzzap Thunder seeming to be time-out actions. 1. SandaledOtter flipped 1 coin(s), resulting in 0 heads and 1 tails, for Beginning of Game. 2. It is now SandaledOtter's turn (Turn #1). 3. gon772 drew a card. 4. SandaledOtter drew Max Elixir. 5. gon772 drew a card. 7. gon772 drew a card. 8. SandaledOtter drew Ultra Ball. 9. gon772 drew a card. 11. gon772 drew a card. 13. gon772 drew a card. 14. SandaledOtter drew Professor Sycamore. 15. gon772 drew a card. 16. SandaledOtter drew Brock's Grit. 17. Raikou became SandaledOtter's new Active Pokémon. 18. SandaledOtter drew Lightning Energy. 19. SandaledOtter attached a Lightning Energy to Raikou. 20. SandaledOtter played Ultra Ball. 21. SandaledOtter drew Tapu Lele-GX. 22. SandaledOtter put Tapu Lele-GX onto the Bench. 23. SandaledOtter's Tapu Lele-GX used its Wonder Tag Ability. 26. SandaledOtter put Voltorb onto the Bench. 27. SandaledOtter put Raikou onto the Bench. 28. SandaledOtter put Voltorb onto the Bench. 29. SandaledOtter played Max Elixir. 30. SandaledOtter attached a Lightning Energy to Raikou. 31. It is now gon772's turn (Turn #2). 32. gon772 drew a card. 34. gon772 drew a card. 35. gon772 drew a card. 36. gon772 drew a card. 37. gon772 drew a card. 38. gon772 drew a card. 39. gon772 drew a card. 40. gon772 played Ultra Ball. 42. gon772 put Gible onto the Bench. 43. gon772 attached a Double Colorless Energy to Gible. 44. It is now SandaledOtter's turn (Turn #3). 45. SandaledOtter drew Lightning Energy. 46. SandaledOtter attached a Lightning Energy to Raikou. 52. SandaledOtter drew Aether Paradise Conservation Area. 53. SandaledOtter drew Field Blower. 54. gon772 drew a card. 55. gon772 drew a card. 56. gon772 drew a card. 57. gon772 drew a card. 58. gon772 drew a card. 59. gon772 drew a card. 60. SandaledOtter put Electrode onto the Bench. 61. SandaledOtter's Voltorb evolved into Electrode. 62. SandaledOtter put Raikou onto the Bench. 63. SandaledOtter's Electrode used its Buzzap Thunder Ability. 64. gon772 took a Prize card. 65. SandaledOtter put Electrode onto the Bench. 66. SandaledOtter's Electrode was Knocked Out. 67. SandaledOtter attached a Electrode to Raikou. 68. SandaledOtter played Aether Paradise Conservation Area. 69. SandaledOtter's Raikou used Thunder Lance and did 110 damage to gon772's Riolu. 70. SandaledOtter took a Prize card. 71. Riolu became gon772's new Active Pokémon. 72. gon772's Riolu was Knocked Out. 73. It is now gon772's turn (Turn #4). 74. gon772 drew a card. 75. It is now SandaledOtter's turn (Turn #5). 76. SandaledOtter drew Lightning Energy. 77. SandaledOtter attached a Lightning Energy to Raikou. 78. SandaledOtter's Raikou used Thunder Lance and did 110 damage to gon772's Riolu. 79. SandaledOtter took a Prize card. 80. Gible became gon772's new Active Pokémon. 81. gon772's Riolu was Knocked Out. 82. It is now gon772's turn (Turn #6). 83. gon772 drew a card. 84. It is now SandaledOtter's turn (Turn #7). 85. SandaledOtter drew Lightning Energy. 86. SandaledOtter's Raikou used Thunder Lance and did 110 damage to gon772's Gible. 87. SandaledOtter took a Prize card. 88. gon772's Gible was Knocked Out. Log Entry: SandaledOtter flipped 1 coin(s), resulting in 0 heads and 1 tails, for Beginning of Game. No debug data found, likely this is an entry for drawing a card, displaying coin flip results, or a similar action. Log Entry: It is now SandaledOtter's turn (Turn #1). Log Entry: gon772 drew a card. Log Entry: SandaledOtter drew Max Elixir. Log Entry: SandaledOtter drew N.
Log Entry: SandaledOtter drew Ultra Ball. Log Entry: SandaledOtter drew Raikou. Log Entry: SandaledOtter drew Professor Sycamore. Log Entry: SandaledOtter drew Brock's Grit. Log Entry: Raikou became SandaledOtter's new Active Pokémon. Log Entry: SandaledOtter drew Lightning Energy. Log Entry: SandaledOtter attached a Lightning Energy to Raikou. Log Entry: SandaledOtter played Ultra Ball. Log Entry: SandaledOtter drew Tapu Lele-GX. Log Entry: SandaledOtter put Tapu Lele-GX onto the Bench. Log Entry: SandaledOtter's Tapu Lele-GX used its Wonder Tag Ability. Log Entry: SandaledOtter drew Brigette. Log Entry: SandaledOtter played Brigette. Log Entry: SandaledOtter put Voltorb onto the Bench. Log Entry: SandaledOtter put Raikou onto the Bench. Log Entry: SandaledOtter played Max Elixir. Log Entry: It is now gon772's turn (Turn #2). Log Entry: gon772 played Cynthia. Log Entry: gon772 played Ultra Ball. Log Entry: gon772 drew Gible. Log Entry: gon772 put Gible onto the Bench. Log Entry: gon772 attached a Double Colorless Energy to Gible. Log Entry: It is now SandaledOtter's turn (Turn #3). Log Entry: SandaledOtter played N.
Log Entry: SandaledOtter drew Guzma. Log Entry: SandaledOtter drew Electrode. Log Entry: SandaledOtter drew Acerola. Log Entry: SandaledOtter drew Aether Paradise Conservation Area. Log Entry: SandaledOtter drew Field Blower. Log Entry: SandaledOtter put Electrode onto the Bench. Log Entry: SandaledOtter's Voltorb evolved into Electrode. Log Entry: SandaledOtter's Electrode used its Buzzap Thunder Ability. Log Entry: gon772 took a Prize card. Log Entry: SandaledOtter's Electrode was Knocked Out. Log Entry: SandaledOtter attached a Electrode to Raikou. Log Entry: SandaledOtter played Aether Paradise Conservation Area. Log Entry: SandaledOtter's Raikou used Thunder Lance and did 110 damage to gon772's Riolu. Log Entry: SandaledOtter took a Prize card. Log Entry: Riolu became gon772's new Active Pokémon. Log Entry: gon772's Riolu was Knocked Out. Log Entry: It is now gon772's turn (Turn #4). Log Entry: It is now SandaledOtter's turn (Turn #5). Log Entry: Gible became gon772's new Active Pokémon. Log Entry: It is now gon772's turn (Turn #6). Log Entry: It is now SandaledOtter's turn (Turn #7). Log Entry: SandaledOtter's Raikou used Thunder Lance and did 110 damage to gon772's Gible. Log Entry: gon772's Gible was Knocked Out. Im currently in a game where is soft lock happened. I was not able to use my turns after my opponent used Buzzap Thunder. After a couple of turns even the time counters stopped. 1. einz flipped 1 coin(s), resulting in 1 heads and 0 tails, for Beginning of Game. 2. It is now davidev94's turn (Turn #1). 3. einz drew Choice Band. 4. davidev94 drew a card. 5. einz drew Darkness Energy. 6. davidev94 drew a card. 7. einz drew Darkness Energy. 8. davidev94 drew a card. 10. davidev94 drew a card. 11. einz drew Darkness Energy. 12. davidev94 drew a card. 13. einz drew Darkness Energy. 14. davidev94 drew a card. 15. einz drew Pokémon Catcher. 16. davidev94 drew a card. 17. einz drew Darkness Energy. 21. einz drew Darkness Energy. 22. einz drew Darkness Energy. 24. Guzzlord-GX became einz's new Active Pokémon. 25. einz put Guzzlord-GX onto the Bench. 26. davidev94 drew a card. 27. davidev94 drew a card. 28. davidev94 drew a card. 29. davidev94 attached a Lightning Energy to Electabuzz. 30. davidev94 attached a Choice Band to Electabuzz. 32. davidev94 drew Nest Ball. 33. davidev94 drew Lightning Energy. 34. davidev94 played Nest Ball. 35. davidev94 put Voltorb onto the Bench. 36. It is now einz's turn (Turn #2). 37. einz drew Darkness Energy. 38. einz attached a Darkness Energy to Guzzlord-GX. 39. einz attached a Darkness Energy to Guzzlord-GX. 40. einz attached a Darkness Energy to Guzzlord-GX. 41. einz attached a Darkness Energy to Guzzlord-GX. 42. einz attached a Darkness Energy to Guzzlord-GX. 43. einz's Guzzlord-GX used its Eat Sloppily attack. 44. It is now davidev94's turn (Turn #3). 45. davidev94 drew a card. 46. Electivire became davidev94's new Active Pokémon. 47. davidev94 attached a Choice Band to Electivire. 48. davidev94's Electabuzz evolved into Electivire. 50. davidev94 put Electrode onto the Bench. 51. davidev94's Voltorb evolved into Electrode. 52. davidev94 attached a Lightning Energy to Electivire. 53. davidev94's Electrode used its Buzzap Thunder Ability. 54. einz took a Prize card. 55. davidev94 put Electrode onto the Bench. 56. davidev94's Electrode was Knocked Out. Log Entry: einz flipped 1 coin(s), resulting in 1 heads and 0 tails, for Beginning of Game. Log Entry: It is now davidev94's turn (Turn #1). Log Entry: einz drew Choice Band. Log Entry: davidev94 drew a card. Log Entry: einz drew Darkness Energy. Log Entry: einz drew Skyla. Log Entry: einz drew Pokémon Catcher. Log Entry: einz drew Guzzlord-GX. Log Entry: einz drew Guzma. Log Entry: Guzzlord-GX became einz's new Active Pokémon. Log Entry: einz put Guzzlord-GX onto the Bench. Log Entry: davidev94 attached a Lightning Energy to Electabuzz. Log Entry: davidev94 attached a Choice Band to Electabuzz. Log Entry: davidev94 played Volkner. Log Entry: davidev94 drew Nest Ball. Log Entry: davidev94 drew Lightning Energy. Log Entry: davidev94 played Nest Ball. Log Entry: davidev94 put Voltorb onto the Bench. Log Entry: It is now einz's turn (Turn #2). Log Entry: einz attached a Darkness Energy to Guzzlord-GX. Log Entry: einz's Guzzlord-GX used its Eat Sloppily attack. Log Entry: It is now davidev94's turn (Turn #3). Log Entry: Electivire became davidev94's new Active Pokémon. Log Entry: davidev94 attached a Choice Band to Electivire. Log Entry: davidev94's Electabuzz evolved into Electivire. Log Entry: davidev94 played Evosoda. Log Entry: davidev94 put Electrode onto the Bench. Log Entry: davidev94's Voltorb evolved into Electrode. Log Entry: davidev94 attached a Lightning Energy to Electivire. Log Entry: davidev94's Electrode used its Buzzap Thunder Ability. Log Entry: einz took a Prize card. Log Entry: davidev94's Electrode was Knocked Out.